Life as a Pregnant Diabetic: WEEKS 23 AND 24 (OR IS IT 21 AND 22??) - IT'S A GIRL! WEEKS 23 AND 24 (OR IS IT 21 AND 22??) - IT'S A GIRL! Well, big news today! We are having a GIRL!! We had our first Fetal Assessment on Tuesday and found out (with certainty) that we will be having a little baby girl in a few months! (Diabetic mothers-to-be typically go through a lot of fetal assessments - basically a more detailed ultrasound.) We couldn't be happier - especially because it means we don't have to repaint the baby's room, which is pink from the previous owner. During the fetal assessment the nurse took lots of measurements and looked at all sorts of things to do with the baby to make sure that she is healthy. We were so pleased to hear that everything looks normal and that there is what appears to be a very healthy baby growing inside of me! 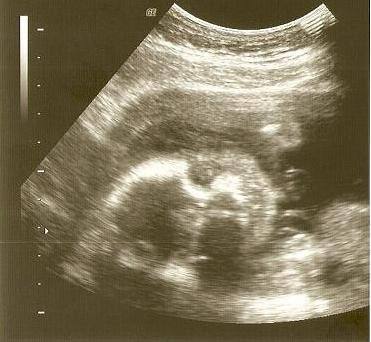 As you may recall, during my 19-week ultrasound, the baby was measuring at closer to 17 weeks. Because there can be a bit of room for error in determining the gestational age of a fetus, and becuase we were quite comfortable with the estimated conception date, my OB decided to keep the due date as it had initially been estimated (June 5th or June 9th, depending on who you ask). But at the fetal assessment, the baby was measuring at 22 weeks instead of 24 weeks, so the nurse is making a strong recommendation to my OB to change the due date (I guess that would put us closer to June 23rd, with induction around June 9th). Since the baby's growth is stable, and since it really does kind of make sense that we could have been off (e.g. perhaps I couldn't get a positive pregnancy test until week 8 because I was actually only at week 6; and maybe I did start to have nausea at week 7 (which is normal) instead of week 9 (which is a bit later than many women)), I'm feeling pretty comfortable with the idea of changing the due date at this point. I see my OB on March 3rd, so we'll figure it out then. At this point, I'm kind of assuming that I'm actually 23 weeks and not 25 weeks, but I'm not going to make any solid changes until I talk to my OB. Because he'll be wanting to induce me around 38 weeks, I'd like to be as sure as possible that we're working with the right due date - otherwise we risk getting the baby out at 36 weeks...which is getting into preemie range. Thankfully I will be having many more fetal assessments before the induction, so the doctor will have a good chance to monitor the baby's development before making any induction decisions. In addition to the fetal assessment, I also saw my endocrinologist this week. My A1C was the best this time that it's ever been (pregnant or otherwise)! Yay! Still a few things to tweak, but in general it's going very well. The baby is still moving around a LOT and sometimes we can feel her kicks with just a light touch. It's nice to know that she's healthy enough to be so active! So far she's not keeping me up at night either. Hopefully it stays that way for a while. I'm still having some discomfort in my knees and hips if I use them too much, but otherwise I'm feeling very good. I had lots of energy this week! I've tried some more of my prenatal yoga and enjoy it, and I've also tried to go for some indoor walks (my office building is attached to a mall) over my lunch break in order to get some exercise without having to navigate icy and uneven ground outside. And now it's photo time! 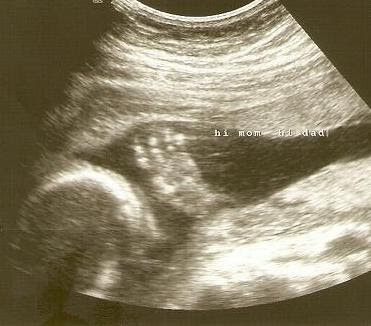 First, I have two pictures of the baby from the fetal assessment. The first one is her face. She's lying down with her chin on the right and her forehead on the left. (Eyeballs don't show up on ultrasound, so she just has eye-hollows in the picture.) The second one shows her head and her hand waving at us! (The nurse added the "hi mom, hi dad".) We were very pleased to be able to take photos home from fetal assessment free of charge, as the regular ultrasound pictures cost $50 (or maybe even more)! I'm also attaching a photo of me taken today. 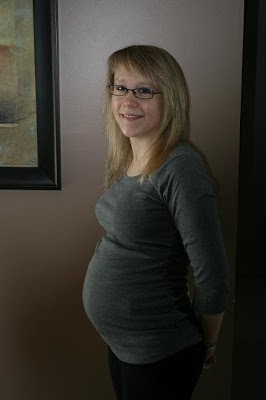 So I guess it's either my 25-week or 23-week picture, but I'm thinking more likely 23 weeks.